Join us for another year of dance, romance, sleepless summer nights where music of tambores never stop! Welcome to the world’s UNIQUE sea, sun & salsa festival! 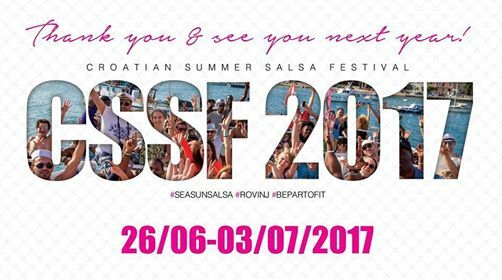 Taking the most out of what Croatia and Rovinj have to offer, CSSF created a unique SEA, SUN & SALSA event. Event activities take place not only in workshop halls and hotels but also throughout the entire town of Rovinj where places like the main town square, MMC hall, narrow coastal alleys and hotel pools turn into colorful and vibrant scenery for what we call CROATIAN SUMMER SALSA FESTIVAL!